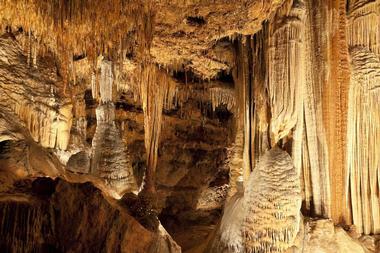 Missouri, especially the Ozark Mountain area, is known as the Cave State – it has 6,000 explored caves. Except Riverbluff Cave, MO all other caves are popular tourist attractions and many are locations for concerts, weddings (popular at Bridal Cave), and other events. Caves are particularly popular during hot Missouri summers when entering a cave with permanently cool temperatures is a big part of the pleasure of visiting them. While most of the caves are explored on foot, some, like Fantastic Caverns, have jeep-pulled trolleys. Bluff Dweller's Cave is an archeologically significant cave located in the Ozark Mountains near Noel, Missouri. It was created during the Paleozoic Era by the flow of water through joints in the St. Joe Limestone. The Paleo-Indians, called Bluff Dwellers, lived in the caves some 12,000 years ago. The caves have about 4,000 feet of explored passages and have been open to the public since 1927. 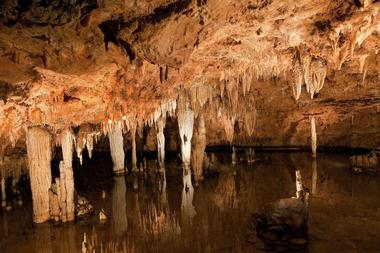 They have a number of interesting speleothems such as lily pads, cave corals, and popcorn. The most fascinating formations are a 2.5 cm thick rimstone pool almost 23 meters long, the Musical Chimes (a curtains of hollow rock stalactites that produce a musical frequency similar to a xylophone), and The Ten Ton Balanced Rock on two pivots. 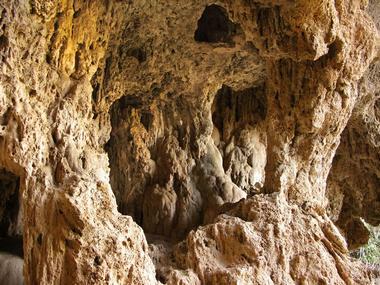 The cave is home to a number of animals such as the albino cave crayfish, the grotto salamander, and eastern pipistrelle bat. 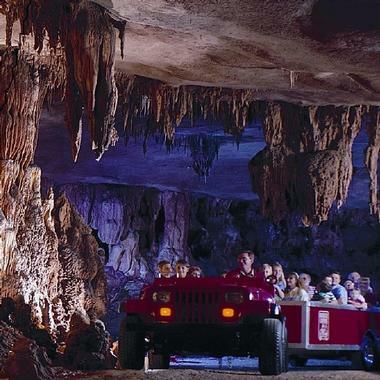 Meramec Caverns is one of the world’s largest cave formations. It is located near St. Louis in the Ozark Mountains, and it has provided shelter to Native Americans for centuries before French colonial miners started exploiting it for its minerals. The cave’s deposits were also used during the Civil War to manufacture gunpowder and the outlaw Jesse James used the cave to hide his men in the 1870s. 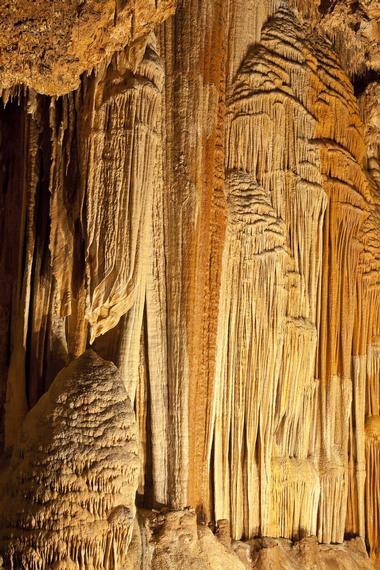 Some of the most fascinating formations in Meramec Caverns are the Stage Curtain, the Underground River, an ancient natural limestone "Wine Table," and a seven-story “mansion” created by nature. The rangers offer guided tours through the caves’ well-lit walkways. Devils Well is an unusual "karst window" that allows visitors to have a look deep into the earth's bowels. The well was created when the roof of a huge cavern collapsed, creating a large sinkhole that has a hole in the bottom through which it is possible to see an underground lake. There is a spiral staircase built to make the viewing easier. Devils Well is located near Akers just off Route KK, and the road leading to the cave is steep and rough. Entrance is free, and there is a light in the stairway the visitors can activate themselves. Outside the cave, a 4.6-mile long trail leads from Devils Well to Cave Spring, and from the trail you can see the path of the water from Devils Well. Located about one mile from Hannibal on Highway 79, Mark Twain Cave is Missouri’s oldest show cave, and the first guided tour was organized in 1886. The tour starts with a seven-minute video about the cave formation and the writings of Mark Twain, as the cave inspired some of his work. During the tour of the Mark Twain cave, experienced guides take visitors on a 60-minute tour along the smooth, flat walkways. One of the most popular tours is the tour of Cameron Cave, which lasts about one hour and 20 minutes and tries to create a natural experience by letting visitors carry lanterns and flashlights so they can imagine what the cave was like when it was explored for the first time in 1925. Outside the cave is a kids’ attraction called Sticks, Stones and Bones where kids can dig for fossils and pan for semi-precious stones. 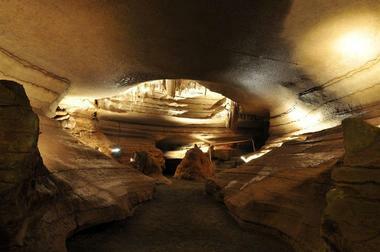 Marvel Cave is located near Branson, Missouri in Roark Mountain in Stone County. The cave is part of the Silver Dollar City theme park and is believed to have the largest cave entrance in the country and one of the largest in the world. This entrance, the Cathedral Room, is 204 feet high, 225 feet wide, and 411 feet long. Visitors enter the cave through an overhead opening and follow a winding stairway to the bottom 94 feet below. 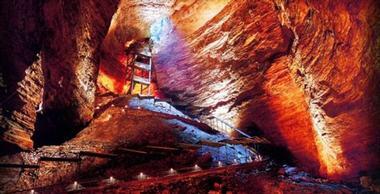 The cave is the deepest in Missouri at 505 feet. There are two cave tours. The most popular is the guided Traditional Cave Touralong well-lit concrete paths. 600 stairs take visitors 500 feet below the surface before they board a cable car back to the surface. Lantern Cave Tour provides visitors with lanterns since there is no electrical light and takes them through caves not usually visited by other tours. Located near Sullivan, Missouri about 60 miles from St. Louis, Meramec Park is a spectacularly beautiful green oasis along the Meramec River, surrounded by forests, bluffs, and caves. There are over 13 miles of hiking trails, a large campground, cabins, and even a motel. Visitors can enjoy swimming, fishing, rafting, and boating in the area There are more than 40 caves in the park, the most fascinating of which is Fisher Cave. 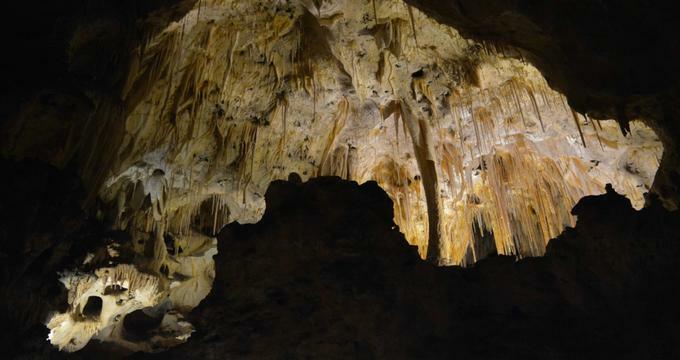 Its low, narrow passages go along the streams to the massive underground rooms filled with calcite deposits such as hellectites and 30-feet tall columns. 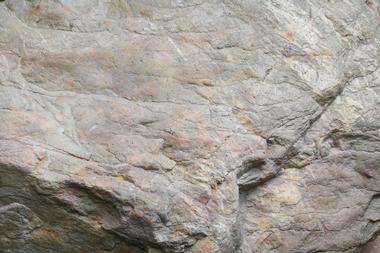 The caves are home to diverse wildlife, and there are even bear claw marks on some walls. There are seasonal tours offered by the park’s naturalists. Onondaga Cave State Park is located on the Meramec River about five miles from the village of Leasburg. The park was established in 1982 and has been declared a National Natural Landmark. The walking tours of the Onondaga Cave take visitors through well-lit one-mile long paved walkways, and guides provide detailed information about geological features such as the Twins, the King's Canopy, dripping stalactites, massive stalagmites, active flowstones, and other unique speleothems. 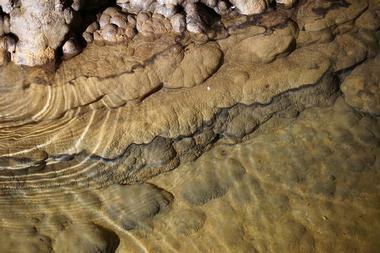 There is even a river flowing slowly through the cave. Outside the cave are the park’s other attractions such as Vilander Bluff Natural Area with a wonderful view of the Meramec River and access to the Meramec River where visitors can fish or canoe. Located in the Lake of the Ozarks State Park, Ozark Caverns is a cave that can only be explored by carrying a lantern since there is no electricity. The first geological formation visitors see is "Angel Showers," a perpetual water shower dripping from the rock high above. Another fascinating feature is a wall of clay with clear bear claw marks a few centuries old. The cave is home to salamanders, four species of bats, and 16 species of invertebrates. Towards the end of the cave, there is a wall where visitors have left their signatures since the 1800's. There is an interesting information center and a museum with artifacts and information on Missouri caves and parks just outside the cave. 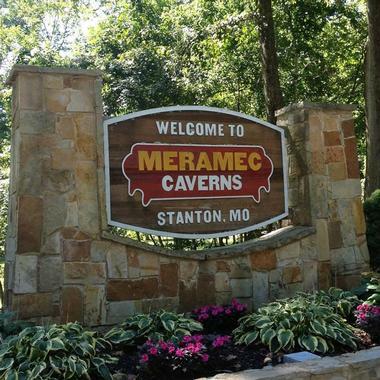 The caves have been used historically by the native peoples as homes and sanctuaries, and later as hiding places for outlaws such as Meramec Cavern. They were used as speakeasies during the Prohibition, which is true for Fantastic Cavern, and have served as sources of minerals. Today, they are enjoyed by thousands of visitors for their unsurpassed natural beauty and fascinating geological formations thousands of years old.